Offering you a complete choice of products which include Printed Thermal Paper Roll. Professionals of our firm, offer these Printer Paper Rolls to the customers from small and medium sized commercial area. These rolls are light in weight and very easy to use for printing the data. Easy to install in printers, these paper rolls are made under the guidance of experts. Moreover to this, these rolls are durable. We are dealing in Local area . Thermal Paper Rolls are available in various dimensions and have smooth texture and bio degradable nature. 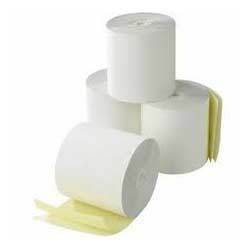 Last but not the least, these Thermal Paper Rolls are offered to clients at economical price.